Paul shows us in the seventh chapter of Hebrews, why Christ is “such” a high priest. This revelation is to inspire confidence in the work He is doing in our behalf. We can come boldly to His throne of grace. 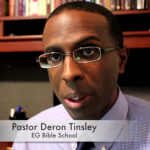 Listen as pastor Deron Tinsley shares this most important subject.